The coolest "bike" you” ever see! 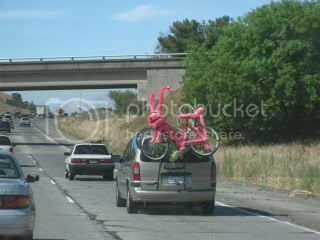 Today on our way back from going to the Farmer’s Market, we saw the COOLEST bike on someone’s car! Seriously, I know you all will be as jealous as I was when I saw it. Told you ~ Now, who is going out to find one of these bikes?! 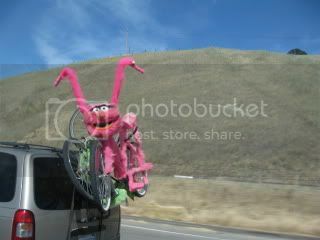 OMG ~ We were absolutely cracking up ~ I only wish I could’ve taken a picture with somoene riding it. I refrained a little at the market this time and only picked up a few things. You can click any of the images below to make them bigger. My story for the blueberries was so cool. The same lady and her husband sell them every year and I overheard her talking to someone about how they blueberries are good to have on Weight Watchers. I asked her if she did Weight Watchers and she said she was a leader. I was like that’s so cool – Where at? Ummm…yup – at my location I go to except on Sundays! I just may have to check her out because she seriously is the type of leader I LOVE – she had so much energy. Anyway as I was walking away she came over and handed me another container of blueberries and said b/c I do Weight Watchers I get more – so cool!!! 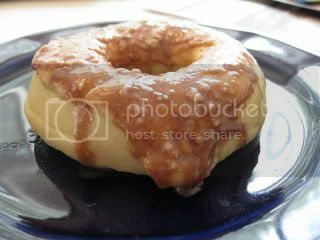 The Husband wanted donuts today and can you believe he asked if he could have Holey Donuts instead of donut shop donuts?! I was soooo proud of him! So, he had two. He started with the Lowfat Chocolate Crumb. 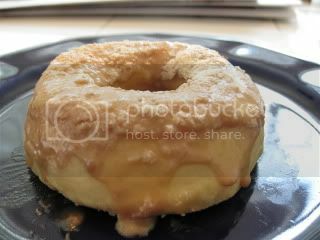 And finished with the Lowfat Caramel Crumb. I’ll admit I HAD to steal a small bite of each to taste them. They were both pretty tasty – I STILL love the bread part the best. The chocolate and caramel flavors were light and not overpowering with hints of cinnamon in them. I think you can tell these are a healthy donut, but, in a good way. He LOVED them both! After my two sample bites, I had a proper Bikini Bootcamp Snack. 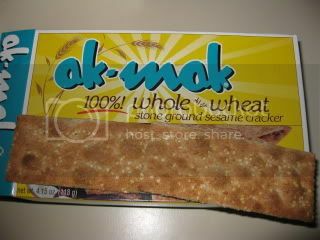 I had a few fruit samples at the market, a couple of organic strawberries when we got home and then three of my Secret Bloggie’s AkMak Sesame Crackers. After we donated our extra washer/dryer to the local charity, we came home for lunch. I marinated the chicken breasts in the Easy Lime Marinade that I made before, but, I used lemons instead of limes. Blended in my Magic Bullet. I didn’t think about it until AFTER the pictures, but, some unsweetened organic coconut as a topper would have been fantastic. 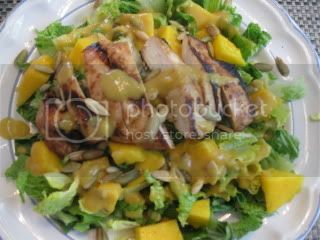 The Mango made the dressing really creamy and fruity sweet. I LOVED this salad – it was light, healthy and super easy to make. I think I am really starting to like Mango after having it so much lately. I read somewhere that if you try something 12 times eventually you will develop a taste for it….hmmmm, maybe it’s true! In other SUPER COOL NEWS, we have TWO new Bikini Camp Recruits – yahoo!!! Good luck in the BOOK drawing ladies. You all still have until tomorrow night to sign up and possibly win the Bikini Bootcamp book – click HERE to find out how. Alright, off to stock up on groceries for week 2 plus get in my meditation, yoga, walk, circuits, journalling! Haha, that bike is hilarious! I don't guess you'd have to worry about someone else having the same ride! What a cool story about the blueberry WW leader…I got a quart of the most yumtastic blueberries at our farmer's market, myself, this morning. Gotta love summertime. How would one go about joining the bootcamp challenge? I just had a baby two months ago and am in need of some motivation/teamwork to help shed my last 10 lbs. Anyway… have a great rest of your weekend! I LOVE THAT BIKE!! That's hilarious!! I just LOVE Farmer's Markets and blueberries. They go well together! HAHA! That bike is HILARIOUS! Wow, I can't even imagine riding that thing! Great finds at the farmer's market. I'm still waiting for most of the summer produce to appear at mine. Those zucchini look so yummy! Perfect for salads. AWESOME mango salad! I just love mixing in a little fruit to all my veggies, and mangos sound perfect! Good luck on the rest of your day… sounds like you'll be busy! OMG! That bike is crazy! Too funny! Hahaha I love the bike! Hilarious! Mmmm I'm so jealous of those donuts. Yum! Sarey ~ Yeah that you want to join in on the Bikini Bootcamp challenge. I have someone ready to partner up with you if you are interested. All you have to do is email me at danicasdaily at gmail dot com and I can enter you for the FREE book drawing. You can find out all the details on the program by going to this link. I will be announcing a winner of the FREE book tomorrow. Olga ~ Yes, it was fur – I think it's a muppets character? Trish ~ The bike is too funnhy – I wonder if they made it our bought it? That mango salad looks delish. Is that a bikini bootcamp recipe? I'll have to try it sometime! I <3 mangos, mmm! Jess ~ That is too funny about the donuts – they are haunting you! Yes, the salad is a bikini bootcamp recipe, modified of course 🙂 I pretty much never leave a recipe alone lol.